The ABO blood group system was first discovered by the Austrian scientist Karl Landsteiner, who found three different blood types in 1900. He described A, B, and O blood groups for which he was awarded the Nobel Prize in 1930. Alfred Von Decastello and Adriano Sturli discovered the fourth type AB in 1902. The Landsteiner's discovery opened the door to the birth of a wide spectrum of discoveries in the field of immune hematology, blood transfusion among humans irrespective of their natives, unmatched pregnancy, legal medicine, anthropology, and the discovery of other blood group systems. Blood groups are genetically determined. The vast majorities are inherited in a simple Mendelian fashion and are stable characteristics, which are useful in paternity testing. Blood groups are known to have some association with diseases such as duodenal ulcer, diabetes mellitus, urinary tract infection, and rhesus (Rh) incompatibility and ABO incompatibility of newborn. The frequencies of ABO and Rh blood groups vary from one population to another and time to time in the same region. The knowledge of distribution of ABO and Rh blood groups at local and regional levels is helpful in the effective management of blood banks and safe blood transfusion services. The present study was conducted among the common population of Baster district of Chhattisgarh state with an objective to observe the distribution pattern of ABO and Rh blood group systems among them. This study will document a blood group database as well as create social awareness among them, allow safe blood transfusion, and prevent hemolytic disease of new born and fetus by knowing ABO and Rh typing. The present retrospective study was carried out at late Shri Baliram Kashyap Memorial Government Medical College and Maharani Hospital blood bank, Jagdalpur, Bastar district, Chhattisgarh, India, during the 2-year period from January 2014 to December 2015. The blood collections were taken from the voluntary donors at outdoor blood donation camp and in-house blood bank as well as from replacement donors at blood bank. Totally 12,852 donors were considered medically fit and accepted for blood donation during the study period. All were of age between 18 and 60 years. After blood donation, blood group was determined by forward blood grouping (cell grouping) by test tube agglutination method. Commercially available standard antisera A, antisera B, and antisera D were used after validation at blood bank. Reverse blood grouping (serum grouping) was performed by test tube agglutination method with pooled known A, B, and O cells that are being prepared daily at the blood bank. Final blood group is confirmed only if both forward (cell group) and reverse groups (serum group) are identical. Rh-negative blood groups were confirmed by antiglobulin technique. All weak D groups were considered as Rh positive. The donor blood group data were recorded on specially formed pro forma, tabulated, analyzed, and compared with the similar studies by other authors. Out of the total 12,852 donors, most of the donors, i.e., 3996 (31.09%) were with blood Group O followed by B (30.44%), A (24.95%), and AB (13.52%) [Table 1]. Out of the 12,852 blood donors, majority, i.e., 12,779 (99.43%) were male and 73 (0.57%) were female [Table 1]. Most of the donors were from age groups of 20–40 years. [Table 2] shows distribution of blood donors according to Rh phenotype. Maximum blood donors, i.e., 12,777 (99.42%) were Rh positive while only 75 (0.58%) were Rh negative. Among Rh-positive donors, O blood group was common (3975), while in Rh-negative donors, blood groups O (21) and B (21) were equally common. [Table 3] shows comparison of various studies of blood group conducted in other parts of India where most of the studies are similar with the present study. Knowledge of the distribution of ABO and Rh blood groups is essential for effective management of blood banks. It is, therefore, imperative to have information on the distribution of these blood groups in any population. Knowledge of blood group distribution is also important for clinical studies, for reliable geographical information, and it will help a lot in reducing the maternal mortality rate, as access to safe and sufficient supply of blood will help significantly in reducing the preventable deaths. Apart from their importance in blood transfusion practice, the ABO and Rh blood groups are useful in population genetic studies, researching population migration patterns as well as resolving certain medicolegal issues, particularly of disputed paternity cases. In modern medicine, besides their importance in evolution, their relation to disease and environment is being increasingly important. It is, therefore, imperative to have information on the distribution of these blood groups in any population group. The ABO and Rh antigens are recognized as the major clinically significant blood group antigens. Blood group is based on the presence or absence of inherited antigenic substance on the surface of red blood cells that can be determined by specific antibodies. More than 600 surface antigens have been found on red blood cells and several of these antigens that stem from one allele or very closely linked genes are collectively form a blood group system. The importance of blood group discovery lies in the transfusion of blood among different populations irrespective of their ethnic origin, in organ transplantation and in the development of legal medicine, genetic research, and anthropology. Human red blood cells contain a series of glycoproteins and glycolipids on their surface, which constitute blood group antigens. Development of these antigens is genetically controlled and they appear early in fetal life and remain unchanged till death. The major ABO blood group system is divided into four blood types on the basis of the presence or absence of A and B surface antigens. The blood groups are A, B, O, and AB. The frequency of four main ABO blood groups varies in the population throughout the world. ABO blood group system derives its importance from the fact that A and B are strongly antigenic and anti-A and anti-B naturally occurring antibodies present in the serum of persons lacking the corresponding antigen and these antibodies are capable of producing intravascular hemolysis in case of incompatible transfusion. Rh antigens are highly immunogenic and till now, 49 Rh antigens are identified. D antigen is most significant and D-negative individuals produce anti-D antibodies if they encounter the D antigen through transfusion or pregnancy and causes hemolytic transfusion reaction or hemolytic disease of fetus and newborn. For this reason, the Rh status is routinely determined in blood donors, transfusion recipients, and in pregnancy. Blood group investigations in this subcontinent started during the 1st World War with Hirschfled in 1919 who determined blood groups in large number of soldiers including Indians and found a high frequency of blood Group B. There is known genetic association of specific blood groups to certain diseases in certain population. Studies concerned about a possible association between ABO blood group and cardiovascular diseases have confirmed that persons of Group A are affected more frequently with coronary heart disease, ischemic heart disease, venous thrombosis, and atherosclerosis, while it is low in people with blood Group “O,” which stated to have protective effect against these diseases. “O” group individuals are known to have a 14% reduced risk of squamous cell carcinoma and 4% reduced risk of basal cell carcinoma when compared to non-O group. It is also associated with a reduced risk of pancreatic cancer. The “B” antigen links with an increased risk of ovarian cancer. Gastric cancer has reported to be more common in blood Group “A” and least in Group “O.” Hence, it is advisable to do blood grouping studies in each region for drafting proper national transfusion policies and supplying blood to needy patients during emergency. Majority of the studies within India have described a large number of male donors compared to female donors similar to our study. This is because of the fact that in developing country like India, because of social taboo, cultural habits, lack of motivation, and fear of blood donation, female donors are very less. In addition, a large number of females from the menstruating age groups are usually anemic with low weight, so they were declared unfit for blood donation and eliminated during the predonation screening and counseling. Hence, general health of females needs to be improved by good nutritional diet and iron supplements. The fear regarding blood donation in females needs to be driven out by making them aware about the advantages of blood donation. Age group of 21–40 years is the main workforce of any society. Hence, they are the most common age group encountered donating blood. Many of the older people suffer from hypertension, diabetes mellitus, low hemoglobin, and ischemic heart diseases and hence may abstain from donating or considered unfit during predonation counseling. Knowledge of frequency of ABO blood group is an important tool to determine the direction of recruitment of voluntary donors as required for zone across the country. The distribution of ABO blood group varies regionally, ethically, and from population to another. 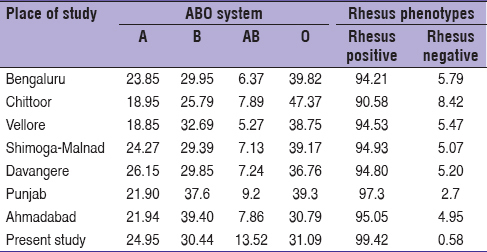 The comparison of frequency and distribution of ABO and Rh group in the blood donors in the present study with the similar studies carried out within India is described in [Table 3]. While looking at ABO grouping, we observed that the distribution of ABO and Rh grouping was comparable to studies done at Bengaluru, Chittoor, Vellore, and Shimoga.,, All these studies had described “O” as the most frequent and “AB” as the least common blood groups similar to our study. The second most common blood group was “B” in the present study similar to the above-mentioned studies. Studies at Punjab and Ahmadabad had contrast findings with “B” being the most common blood group followed by “O,” “A,” and “AB.”, While looking at Rh grouping, 90%–97% donors of most of the studies in India were detected as Rh positive. In our study also, Rh-positive donors were 99.42%. Apart from transfusion service, knowledge of the blood group system helps to take preventive measures against the diseases which were associated with different blood groups, to prevent the dangerous transfusion reactions, and for the efficient management of blood bank and transfusion services to the needy patients. The present study concludes that “O” blood group is the most common blood group among the blood donors in this study of blood bank in Jagdalpur. This is followed by “B,” “A,” and “AB” blood groups. Regarding Rh blood group system, Rh-positive donors were 99.42% and Rh-negative were 0.58%. Blood donation by females was very low and it needs to be increased by improving health status and awareness about blood donation. Every individual should be ABO grouped at birth since the antigens are naturally occurring. Blood group of individuals must be indicated on national identity cards, driving licenses, and school/office identity cards, which will be of great use in case of acute hemorrhage or anemia in children when urgent transfusion of blood is required. It is necessary to conduct similar well-designed studies in other states of India to determine the blood group frequencies. Landsteiner K. Zur Kenntnis der antifermentativen, lytischenand agglutinierendenwirkungen des Blutserums under lymphe. Zentralbl Bakteriol 1900;27:357-62. Von Decastella A, Sturli A. Ureber die isoagglutinine in serumgesunder and Kranaker Menschen. Mfiner Med WSchr 1902;49:1090-5. Jolly JG. Medicolegal significance of human blood groups. J Indian Med Assoc 2000;98:340-1. Hoffbrand AV, Pettit JE. Blood Transfusion in Essential Haematology. 5th ed. Oxford UK: Black Well Scientific Publication; 2006. p. 307-9. Skaik Y, El-Zyan N. Spectrum of ABO and Rh (D) blood groups amongst the Palestinian students at Al-Azhar University-Gaza. Pak J Med Sci 2006;22:333-5. Enosolease ME, Bazuaye GN. Distribution of ABO and Rh-D blood groups in the Benin area of Niger-Delta: Implication for regional blood transfusion. Asian J Transfus Sci 2008;2:3-5. Khan MS, Subhan F, Tahir F, Kazi BM, Dil AS, Sultan S. Prevalence of blood groups and Rh factor in Bannu region NWFP (Pakistan). Pak J Med Res 2004;43:8-10. Firkin F, Chesterman C, Penington D, Rush B. Blood groups; blood transfusion; acquired immune deficiency syndrome. In: De Gruchy's Clinical Hematology in Medical Practice. 5th ed. New Delhi: Oxford University Press; 1989. p. 475-96. Waite GN. Blood components. In: Rhoades RA, Bell DR, editors. Medical Physiology: Principles for Clinical Medicine. 3rd ed. USA, Philadelphia: Lippincott Williams and Wilkins; 2009. p. 169-86. Storry JR. Human blood groups: Inheritance and importance in transfusion medicine. J Infus Nurs 2003;26:367-72. Harmening MD, Firestone D. The ABO blood group system. In: Harmening MN, editor. Modern Blood Banking and Transfusion Practices. 5th ed. Philadelphia, USA: FA Davis Company; 2005. p. 108-32. Bethesda DL. Blood groups and red cell antigens. In: The Rh Blood Group. USA: National Center for Biotechnology Information; 2005. p. 1-6. Swamy CM, Basavaraj PB, Kavitha GU, Shashikala P. Prevalence of ABO and Rhesus blood group among blood donors. Indian J Public Health Res Dev 2012;3:106-9. Giri PA, Yadav S, Parhar GS, Phalke DB. Frequency of ABO and Rhesus blood groups: A study from a rural tertiary care teaching hospital in India. Int J Biol Med Res 2011;2:988-90. Reddy KS, Sudha G. ABO and Rh (D) blood groups among the Desuri Reddis of Chittoor District, Andhra Pradesh. Anthropologist 2009;11:237-8. Das PK, Nair SC, Harris VK, Rose D, Mammen JJ, Bose YN, et al. Distribution of ABO and Rh-D blood groups among blood donors in a tertiary care centre in South India. Trop Doct 2001;31:47-8. Sidhu S. Distribution of the ABO blood groups and Rh (D) factor among the scheduled caste population of Punjab. Anthropologist 2003;5:203-4. Patel PA, Patel SP, Shah JV, Oza HV. Frequency and distribution of blood groups in blood donors in Western Ahmedabad – A hospital based study. Nat J Med Res 2012;2:202-6.